Digi-Schlock: COUNTESS DRACULA (Synapse Blu-Ray/DVD Combo Pack) – Schlockmania! Synapse has done fans of classic horror a favor in the last few years by undertaking blu-ray/DVD combo releases of a set of films that Hammer co-produced with Rank in the U.K. Their editions of Vampire Circus, Twins Of Evil and Hands Of The Ripper were a hit with fans and gave a well-deserved revival to the oft-overlooked “new wave of Hammer” titles that company produced at the turn of the ’70s. Synapse has recently completed this series with a blu-ray/DVD release of Countess Dracula and the results offer a fitting close this string of releases. Things begin with an excellent HD transfer of Countess Dracula at its theatrical ratio 1.66:1. The blu-ray was watched for this review and the glossy photography looks lovely here, achieving a sense of depth in both detail and colors. The results do well by the typically lush production style of this Hammer favorite. The audio sticks to the film’s original mono mix, presented in a lossless format on the blu-ray. It’s a solid vintage mix and Harry Robinson’s swooning orchestral score gets a real punch from the new digital clarity it receives. Synapse also includes a set of bonus features, the same on both discs. The largest is a commentary track that features star Ingrid Pitt, director Peter Sasdy, screenwriter Jeremy Paul and moderator Jonathan Sothcott. Sasdy and Paul take the lead here, with Sasdy discussing how he leveraged his b ackground directing theater for the BBC to bring in top actors and technicians for the film while Paul discusses the motivations behind each scene as well as the complex balance of elements he had to maintain. Pitt chimes in with some interesting material, including how she landed the role and her well-researched opinion on the real Countess Bathory. Sothcott does a solid job moderating, giving the participants plenty of room to talk but interjecting the occasional question to give the comments focus. All in all, a solid track for Hammer fans. There are also two Pitt-centric extras to be enjoyed here. The first is an 11-minute featurette called “Immortal Countess” that offers a sketch of her life story, with genre historians like Ted Newsom, Robert Cotter and Richard Klemenson offering a spoken history. It is revealed that she escaped from childhood imprisonment in a concentration camp to establish a showbiz career on her own terms. The participants also offer a nice appreciation of her work in Countess Dracula. There is also an eight and a half minute audio interview with Pitt from a promotional engagement for the film Who Dares Wins. She speaks fondly of the enduring nature of the fandom for her horror work and also tells a funny tale about Richard Burton and Where Eagles Dare. The package is rounded out by a theatrical trailer, the original 3-minute spot produced for the film’s U.K. release. It does a good job of selling the film and Pitt’s unique “dual” role. 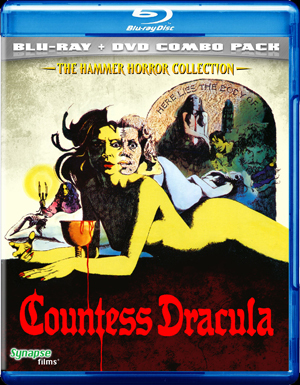 All in all, this set of Countess Dracula is a solid finale for Synapse’s string of HD Hammer releases and a treat for fans of vintage horror. 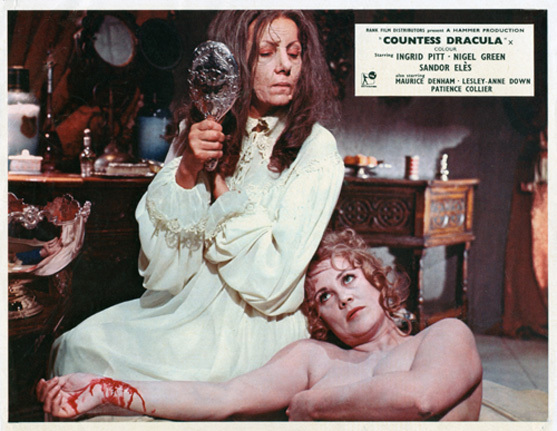 To read Schlockmania’s film review of Countess Dracula, click here.